Senior Investigator Jo Stuart is assigned to the National Crime Agency to hunt for the killer of a man recently unearthed in woodland outside Manchester. It's discovered he had been bound, gagged and buried alive some ten years earlier. When Jo finds links to other disappearances, she realises she must act quickly to prevent a further tragedy at the hands of a serial killer. 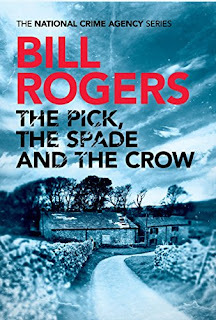 The Pick, The Spade and The Crow was an engrossing British police procedural novel with an engaging female protagonist. It was a fairly quick and easy read without in-depth descriptions of violence and murder. I felt the balance was just right; I was able to visualise the horror without the author needing to paint it in vivid colour. Links to Freemasonry and its symbolism were a good addition, despite having been somewhat overdone in fiction of recent years. Overall, I thought this was an enjoyable read that wasn't bogged down by its own self-importance. My thanks to Bill Rogers, Thomas & Mercer and NetGalley for providing a copy of this book. Newly promoted to the NCA's Behavioural Sciences Unit, Senior Investigator Joanne Stuart is determined to hunt down the perpetrator. Just as Jo's investigation begins to reveal links with other disappearances, there is another murder. This is no longer a cold case; she is dealing with the escalating violence of a chilling serial killer. Stepping into a sinister world of secrets, symbols and rituals, Jo will have to confront the legacy of her own past and the violent memories that lurk there if she is going to solve this case. But at what cost?